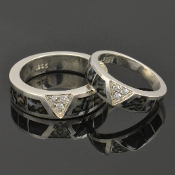 Our wedding rings for women are available in sterling silver, Continuum silver, gold and platinum. 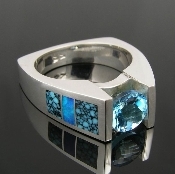 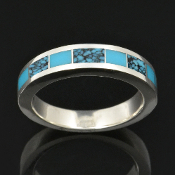 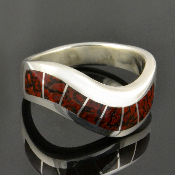 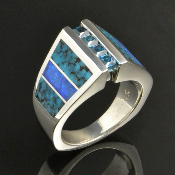 Our most popular inlay materials are turquoise, dinosaur bone, opal and sugilite accented by gemstones such as Moissanite, topaz, black diamonds, sapphires, and amethysts. 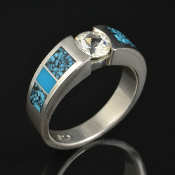 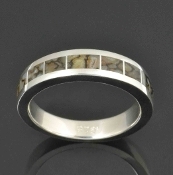 Your wedding ring will be made to order in your ring size in 4 to 6 weeks and may be customized by choosing the inlay materials, gemstones and metal used for your ring. 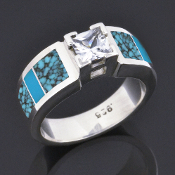 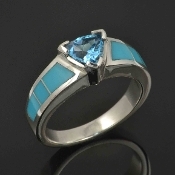 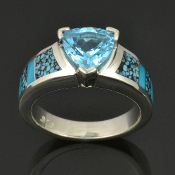 Some customizations will be upgrades so please contact us with your ideas and ring size for a price quote. 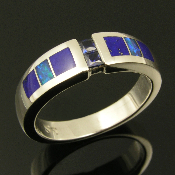 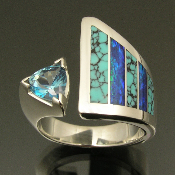 Woman's sterling silver band featuring 2 channel set blue sapphires accented by inlaid lapis and Australian opal. 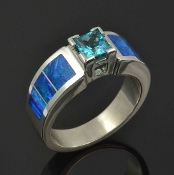 The two princess cut blue sapphires have a total weight of .16 carats and are high quality. 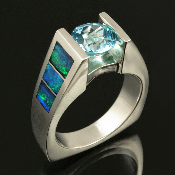 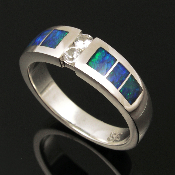 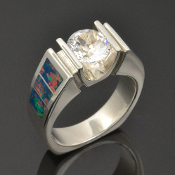 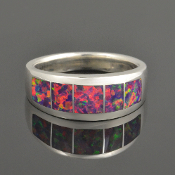 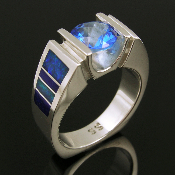 Handmade sterling silver wedding ring inlaid with Australian opal accented by white sapphires. 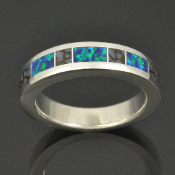 Beautiful inlaid blue-green Australian opal with some red flashes surrounds three round brilliant cut white sapphires in this unique wedding band. 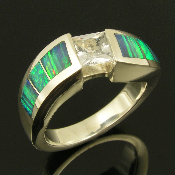 Incredible opal inlay ring! 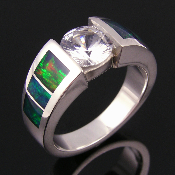 Australian opal inlay sterling silver ring accented by a sparkling white sapphire. 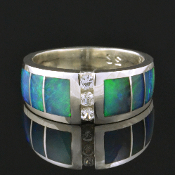 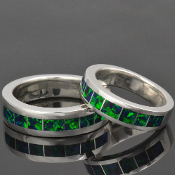 The ring's Australian opal inlay is a deep green with flashes of blue, green, yellow and orange. 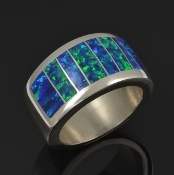 This opal ring is very unique and unusual! 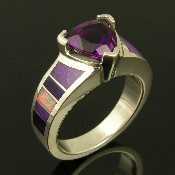 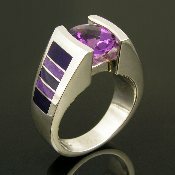 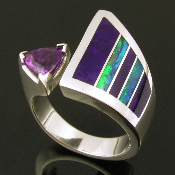 Amethyst silver ring inlaid with Australian opal and sugilite Silver topaz ring inlaid with turquoise and Australian opal Sterling silver Amethyst ring inlaid with sugilite. 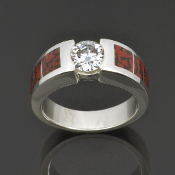 We offer a variety of options for engagement rings if you are looking for a matching bridal set. 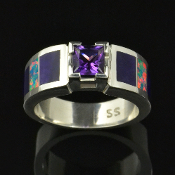 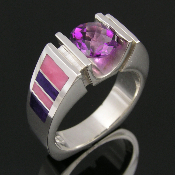 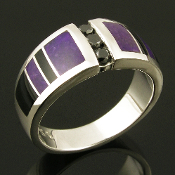 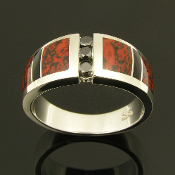 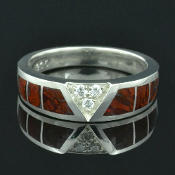 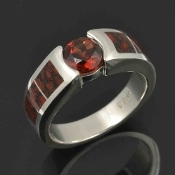 We can also create a matching ring if you would like a matching wedding ring set. 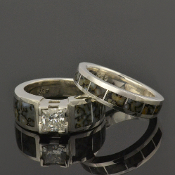 We can make the wedding set in his and hers, hers and hers or his and his combinations. 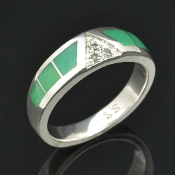 Contact us a for price quote.